Money tree is usually called crassula. 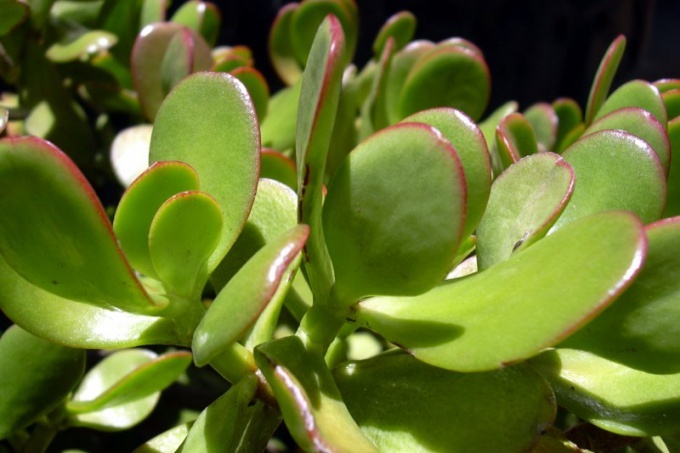 It is a small tree with oval thick leaves, which the plant received another name – jade. Money tree belongs to the succulents. In natural conditions these plants during the rainy season, accumulate fluid in the fleshy stems or leaves, and a dry season gradually spend it. Jade in some cultures is considered a symbol of wealth and prosperity. Regardless, you practice of Feng Shui or not, define money tree bright corner of the room. Wanting to equip your home according to Feng Shui, determine the apartment the area of wealth, and it is the angle that it was in the South-Eastern part of your home. This tip is also suitable for those who just want to provide the plant optimal conditions, as the light in this corner always enough. In addition to the light, jade need some fresh air. Area, where there will be a plant, should be well ventilated. Money tree – a hardy plant, and the open window will not bring him harm, even in the dead of winter. Much worse, this plant will feel in the heat and stuffiness. Corner, where it will be crassula, must always be clean. The dust clogs the pores on the leaves, the plant receives less moisture. Best of all, if you put jade on a stand, which can be often clean. Generally the place should be such that to each point was easy to reach with a wet cloth. Next you can put items to care for plants – watering can, a spray bottle, a sponge to wipe the leaves, etc. An important role plays the color of the area. If you adhere to the principles of Feng Shui, it is better to choose the Wallpaper or the carpet dark blue, dark green or black. Red items are better to remove. By the way, this is true for those who have such ideas are shared crassula looks better on a dark background, and the red objects will distract her attention. A very good solution would be to put crassula next to the aquarium. In this case observed and the colors, and humidity. Water evaporates from the surface of the aquarium in sufficient quantity to ensure that the tree felt good. Among the adherents of Feng Shui, the wealth area may not be alone in a room or in the kitchen. It is possible that it will be in the bathroom or hallway. Real crassula in a dark room can not live, so it's best to make an artificial money tree. Topiary can be made of many different materials – paper, fabric, plastic. The General principles of its placement will be somewhat different. An artificial tree does not need sunlight and frequent airing. The angle must be in the South-Eastern part of the zone, it is often necessary to remove. Color scheme of the room is the same as in the first case – that is Wallpaper or tile shall be dark, and bright objects are best removed. By placing the tree in the bathroom, don't forget to replace the current faucets and faulty pipes, according to the legend, and the money will not flow out of the house.